Welcome to Best Western Patriots Point! 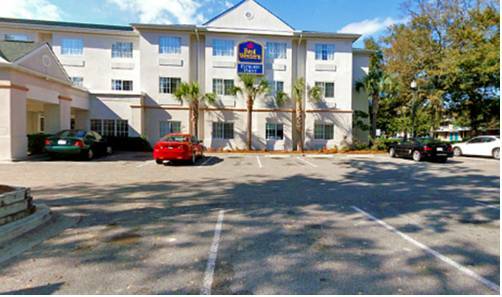 Enjoy genuine southern hospitality at our Mount Pleasant, SC hotel, conveniently located close to many universities. Patriots Point hotels are near the Medical University of South Carolina, College of Charleston, Citadel, Trident Technical College and Charleston Southern University. Historical Charleston is just moments away, where you can soak up southern history by visiting one of the nearby plantations, including Boone Hall Plantation, Drayton Hall Plantation, and Magnolia Plantation and Gardens. Mt. Pleasant, SC hotels are also near the popular Patriots Point Naval and Maritime Museum. Our Mount Pleasant hotel is conveniently located close to the beach, so guests can enjoy a day of exploring Sullivan's Island, Isle of Palms, or Folly Beach. The Family Circle Tennis Cup Tournament is a favorite local event, and we're happy to host many guests in town to partake in it. Hotels in Mount Pleasant, SC make it easy for guests to enjoy the Summerville Flowertown Festival or Cooper River Bridge Run. The Cajun Festival is a must for foodies, and the Southeastern Wildlife Expo is great for families on vacation. Whether you want more relaxation or adventure, there's an event or attraction for everyone near our Mount Pleasant hotel. We're also happy to host visiting business travelers, and are a favorite for employees of Boeing, Alcoa, Nucor Steel and Santee Cooper. If you're here for work, count on us to make your stay just a little bit easier. A friendly atmosphere, dreamy bedding and spacious rooms make it simple to squeeze in a little time for play. After all, it's nearly required to do a little exploration. Staff members can provide recommendations on the must-see attractions and best dining. Book your next room at Best Western Patriots Point, where the comfort of guests is a top priority! From: The north. Take Interstate 95 South to Interstate I26 East. Once on Interstate I26 East take Exit 220 (Mt Pleasant) to Highway U.S. 17 North. At the first traffic light on U.S. 17 North make a right on McGrath Darby Boulevard, the Best Western Patriots Point will be on the right. From: The south. Take Interstate 95 North to Interstate I26 East. Once on Interstate I26 East take Exit 220 (Mt Pleasant) to Highway U.S. 17 North. At the first traffic light on U.S. 17 North make a right on McGrath Darby Boulevard, the Best Western Patriots Point will be on the right. From: The west. From Atlanta, GA, take Interstate 20 East to Interstate I26 East, Once on Interstate I26 East take Exit 220 (Mt Pleasant) to Highway U.S. 17 North. At the first traffic light on U.S. 17 North make a right on McGrath Darby Boulevard, the Best Western Patriots Point will be on the right. 5.00 mile(s) from The village Tavern, Bar/Lounge, American, open to 2:00 a.m. Pool - Outdoor pool The outdoor pool will be close for the season beginning October 15, 2015 through April 4, 2016. 112 mile(s) from Savannah, GA.
1.00 mile(s) from Patriots Point Naval and Maritime Museum, home of USS Yorktown, World War II aircraft carrier. 2.50 mile(s) from Splash Island in Mt. Pleasant, outdoor water family fun for all ages...featuring a "16 foot otter slide and swirling cyclone"
Snakes, crocs, lizards -- in both indoor and outdoor pits. Run by the Clamp brothers since 1999. Every Thursday afternoon is the Venom Extraction show. ~28 miles from Mount Pleasant. An African village was created on American soil. Then it seceded from the United States. ~54 miles from Mount Pleasant. Watch knights joust to the death while you rip apart chicken with your bare hands! Long running themed dinner show. ~84 miles from Mount Pleasant.